In this tutorial, we will show you two methods for correcting the digital noise in your photos, High Quality and PRIME, for optimal results. Use of PRIME denoising requires the Elite edition of DxO OpticsPro 10. 1 – What is digital noise? 1- What is digital noise ? Digital noise is parasitic information that appears randomly and unattractively in certain parts of photos; it is particularly visible in the darkest and in the most uniform areas. It is especially noticeable in images taken at high ISO: the higher the sensitivity, the greater the noise and degradation of image quality, particularly after brightening the dark areas in post-processing. Luminance noise: Its structure resembles that of analog film grain, more or less tight or regular, depending on the type of camera used. It is tricky to correct because it interferes with the finest details in the image, and correcting it can mean smoothing away those details. Chrominance noise: This is particularly noticeable in the dark areas of an image, and manifests as clumps of pixels (generally green and magenta). This kind of noise is easy to correct because it does not interfere with the details in the image. There is also low-frequency noise, which can be found in the most uniform areas, and which is coarser than high-frequency noise. The quality of the sensor, in particular its capacity for recovering information in the darkest areas, is an important factor in whether or how much noise will appear in an image. To understand how well your sensor works, go to the DxOMark website which contains evaluations of the vast majority of cameras on the market. On DxOMark, the higher the score for “Sports (low-light ISO),” the better your camera is in this regard. The score for Dynamic Range is also useful for understanding how well your sensor recovers information in low light. Sports photos (in particular indoor sports) and concert photos, when you need to use a very short exposure time despite the limited available light. Night or interior photos when not using a tripod. Manage your exposure correctly: noise mostly appears in the darkest areas, and correcting over-exposed areas generates far less visible noise. So take care to correctly expose your photos when shooting, up to and including slightly over-exposing them so as to limit the amount of correcting you will need to do in the dark areas (but still making sure not to burn the highlights, of course). As much as possible, work with a tripod, in particular for your night shots and interior photos. That way you won’t need to worry about exposure time, and you can use a lower sensitivity setting. Above all, work in RAW: that way you will have many more possibilities for correcting your images..
To obtain the best possible results, we advise you to work in RAW rather than in JPEG. In fact, JPEG files already undergo significant noise reduction in the camera, which can suppress some of the details in the image, and makes it difficult to apply a second noise correction to your image. To see both noise and DxO OpticsPro’s corrections, we advise you to work at a zoom level of 1:1 (100 %). Nevertheless, you can also display the image as it suits you, and preview the correction in the preview window in the Noise reduction sub-palette. 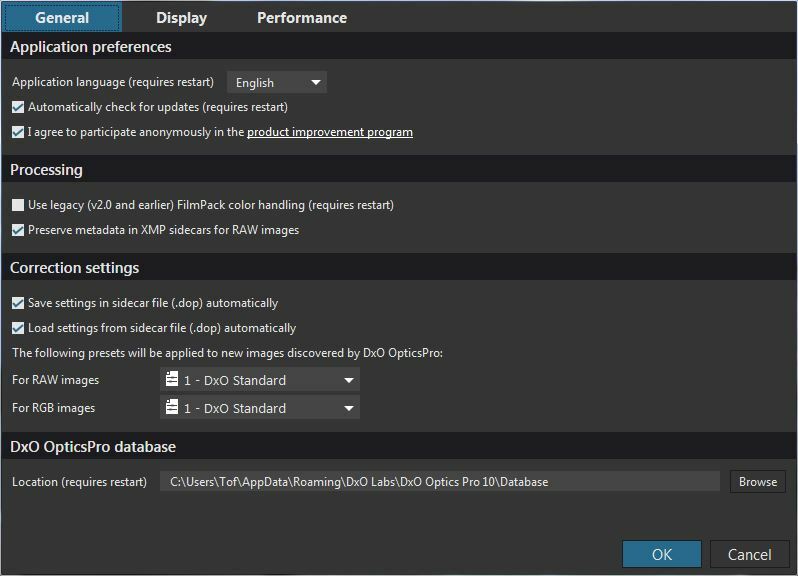 When you open an image in DxO OpticsPro, the DxO Standard preset is automatically applied. In addition to correcting tone and color, this preset applies a noise correction that is tailored to your camera and to the ISO used to shoot. You have several ways to see the noise corrections. button located in the upper command bar. In this display mode, 1 pixel on the screen equals 1 pixel in the image, making it easy to see the efficiency of the noise correction. button, also located in the upper command bar. 3) Finally, you can leave the image displayed on the screen and use the preview window in the Noise reduction sub-palette. You can also choose an area in the image after activating and placing the loup in the image, followed by a mouse-click (Center loupebutton at the right, over the preview window). DxO OpticsPro automatically corrects the noise in your images. 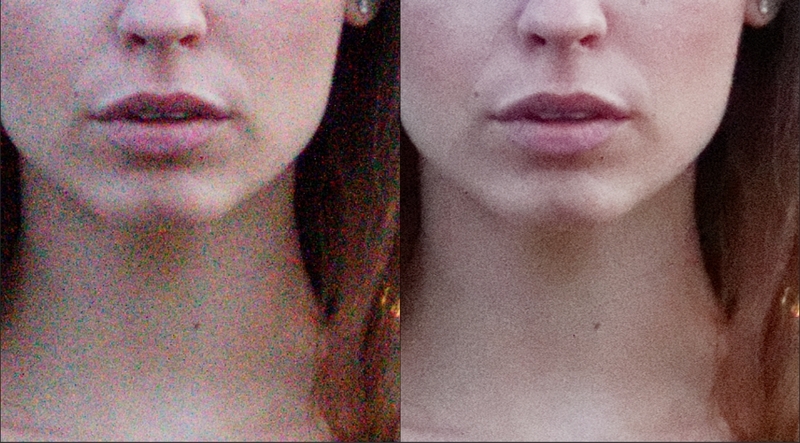 You can also adjust these corrections manually by using the tools in the Noise reduction sub-palette. Available in the Elite edition of DxO OpticsPro 10, PRIME works exclusively with RAW files. 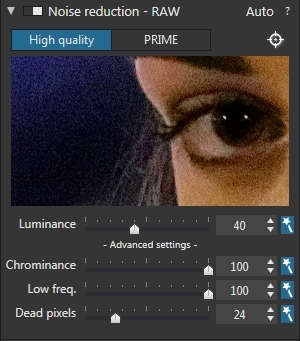 High Quality noise reduction already produces exceptional results in real time, but if you want to improve the correction even more, if (for example) you took your photos at very high sensitivities, or with an older camera, you can opt for PRIME mode. PRIME technology makes no compromises about reducing noise, assuring optimal preservation of details and colors while requiring longer processing time. symbol on the same level as the palette name reminds you, you will not be able to see the result across your entire image; to get an idea of the rendering (prior to export), use the loupe tool available above the setting tools. Move the loupe into different places in the image to have a preview of the rendering in the different areas (see paragraph 2 about using the loupe). As processing speed is not a priority for the PRIME tool, refreshing the image, even at the loupe level, can take a few seconds. Processing is indicated by an animated pictogram in the lower right corner of the thumbnail. If you work with Mac OS, you can compare the before/after images by clicking in the preview window. 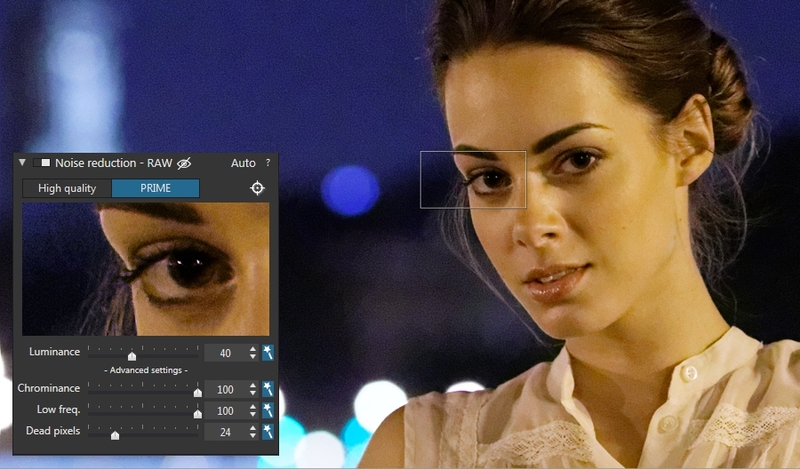 The preview loupe in the image and in the Noise reduction palette. In order to see the results of the rendering for the entire image, you will have to export the image. In this case, ideally you can create a test image using the standard output settings (JPEG), and export it to the original folder as the destination folder. This way you can compare between the original uncorrected image and the corrected output image, and if necessary, you can adjust the corrections using the sliders in the Noise reduction sub-palette. 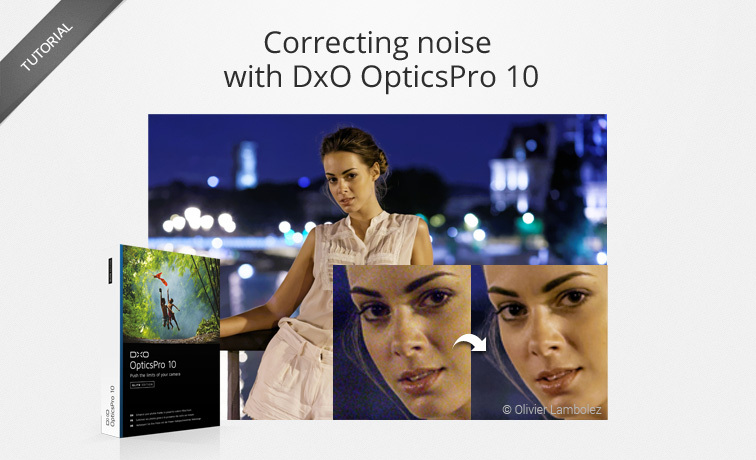 DxO OpticsPro offers two excellent automatic noise corrections – High Quality and PRIME (Elite Edition); even so, you can choose to use the sliders available to you for manually correcting the digital noise in your images and obtaining the rendering that you desire. To help you easily reproduce your own corrections, you have the possibility of creating a custom preset. To do so, right-click on the image after applying your corrections and select Create preset from current settings. In the dialog box that appears, name your preset. 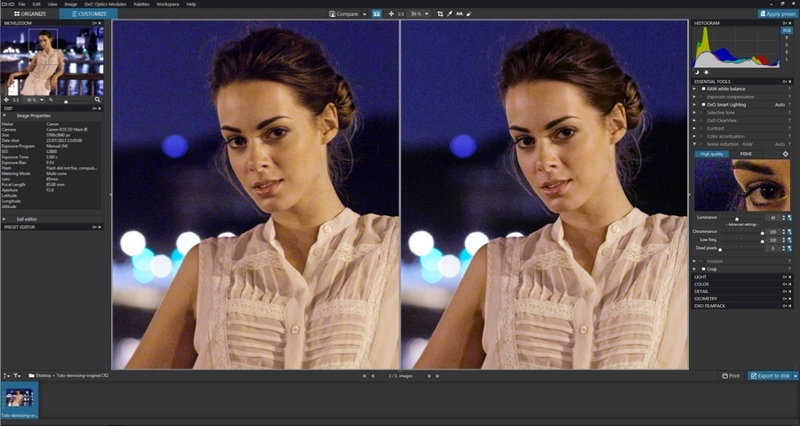 This preset will let you apply all the same corrections defined for your reference image. You can use this custom preset to replace the DxO Standard default preset, for example, in order to modify on the the digital noise correction. To replace the default preset with your own custom preset, go into the General tab in the Preferences, accessible from the Editmenu (Windows) or from the DxO OpticsPro 10 menu(OS X), and replace the preset to apply when you next open a new image in DxO OpticsPro.